Managing everyday toilet functions can be one of the most challenging aspects of coping with ageing or disability. Modern toilet aids can make life simpler, safer, and more convenient for the elderly or anyone with mobility issues, but it’s important to select the style and model that best matches the needs of each user. An amazingly wide selection of toilet aids are available in a variety of price ranges, which makes it possible to find the right make and model for any budget. But the sheer volume of choices available can be confusing, especially for a first-time buyer; here’s a breakdown of the most common types of toilet aids available, with some tips for making your selection. 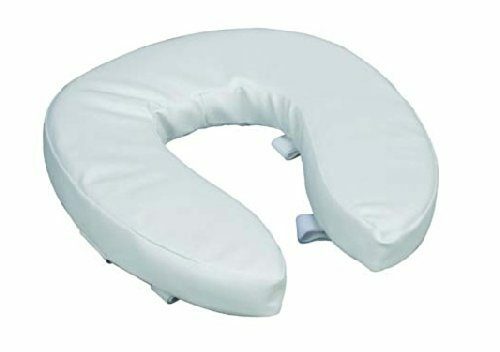 Raised Toilet Seats: these are the most basic and affordable toilet aids, designed to sit on top of the existing toilet seat and raise its height from 2 to 6 inches. For users who just need some help getting up and down, these simple, unobtrusive seats may be all that’s needed for comfort and independence. 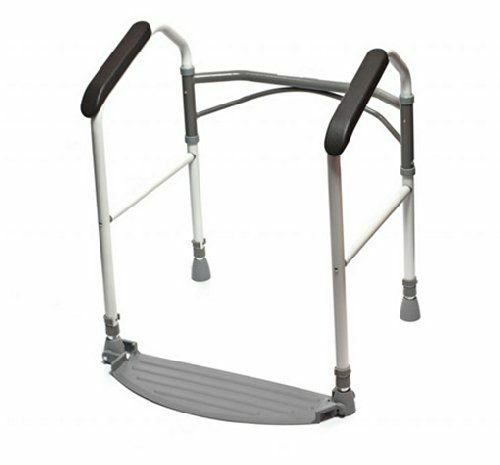 People who use a walker or walking frame may find that a raised toilet seat is a simple and convenient alternative to a toilet surround or toilet frame. 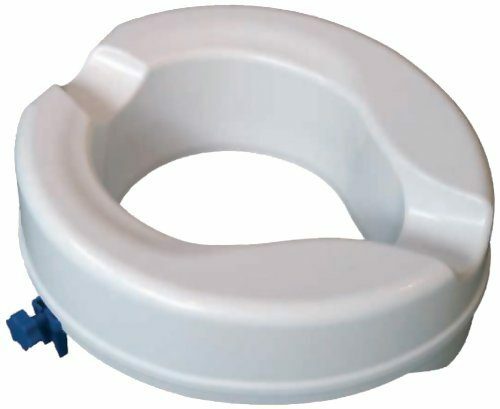 Raised toilet seats function like bolsters that are simply fitted over the existing toilet seat, and most are designed to be clipped or bolted in place for security. Some seats offer an optional attached lid, and most are made with front and rear cut-outs to make personal cleansing easier. 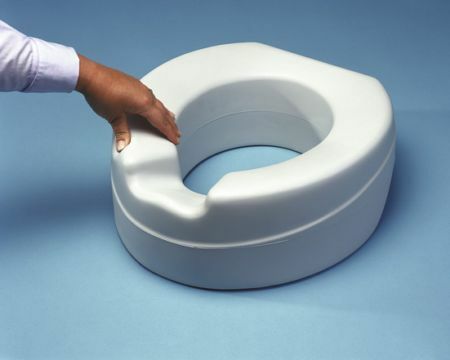 Raised toilet seats are typically made of high-grade, easy-to-clean lightweight plastic that’s stain and odor resistant, though padded models are also available. 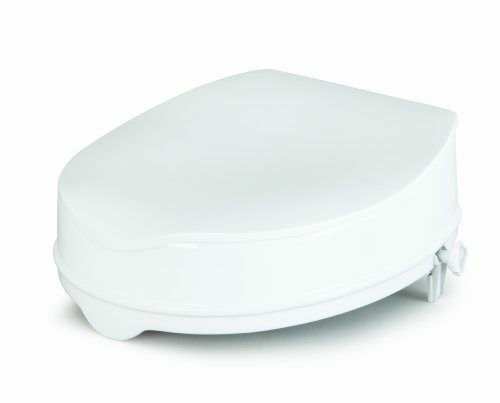 Standard raised toilet seats generally accommodate weights up to 120Kg while bariatric models can be safe for 180kg or more. Raised toilet seats are generally very inexpensive, with prices starting well under £20. They’re small and space-efficient enough for easy use in even a cramped bathroom, and they can easily be moved from one toilet to another if necessary or even taken along when travelling. 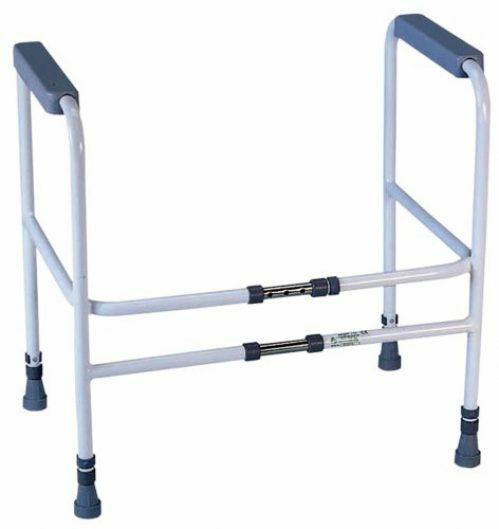 They’re a good choice for people with minor mobility problems but may not provide enough support or stability for wheelchair users or people with severe mobility issues. Measure your toilet and note the shape of the seat before you begin to shop; raised toilet seats fit directly onto the existing toilet, so it’s important to select a model that matches in both shape and size. For maximum safety and security, look for models that either clip or bolt securely to the existing toilet seat. Good basic models in the £20 price range include the Savannah 2-Inch Raised Toilet Seat, the Homecraft 4-Inch Raised Toilet Seat, the Aidept 4-Inch Senator Raised Toilet Seat, and the Drive Medical 6 Inch Raised Toilet Seat. 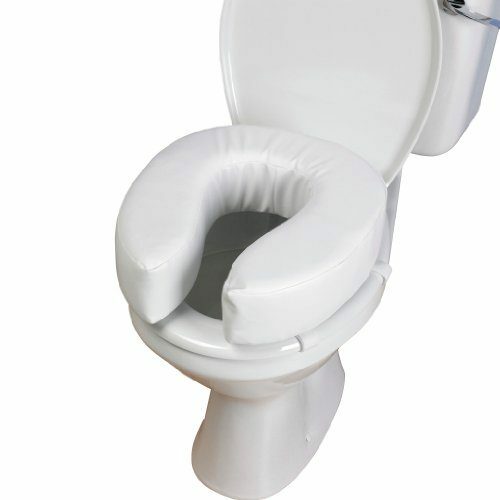 Foam padded models in the same price range, like the Homecraft Padded Raised Toilet Seat or the Ability Superstore Padded Raised Toilet Seat offer a softer, more cushiony seat. 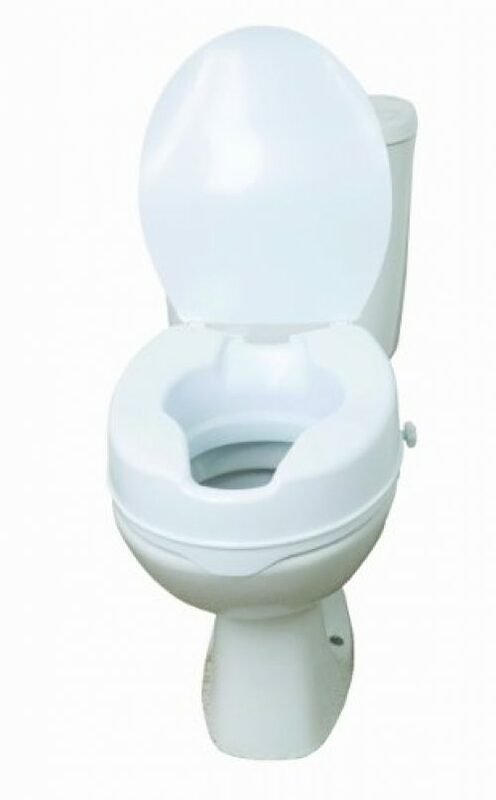 Raised toilet seats with arms are a variation on the raised toilet seat, offering additional security at a price that remains very affordable with many models available in the £20 to £50 price range. Like the basic models, they’re clip or bolt-on units designed to raise the toilet seat to make getting up and down easier, but they also come equipped with attached arms that give the user increased leverage and security. 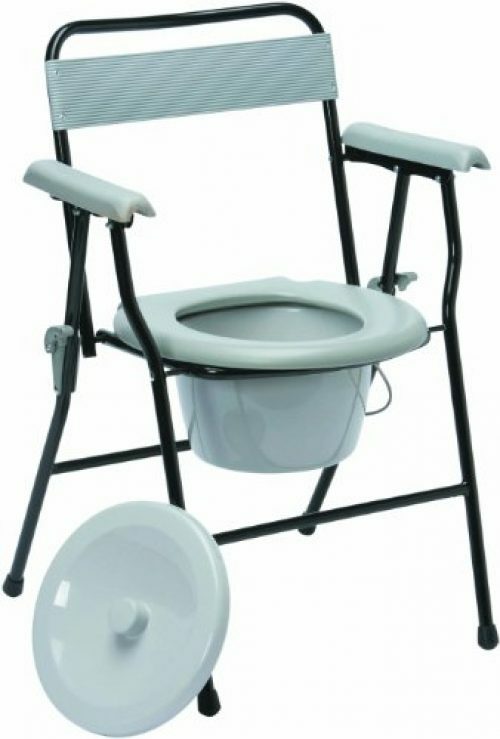 This provides a degree of stability and assistance that’s similar to that offered by a full toilet frame, but in a more portable and less bulky unit. 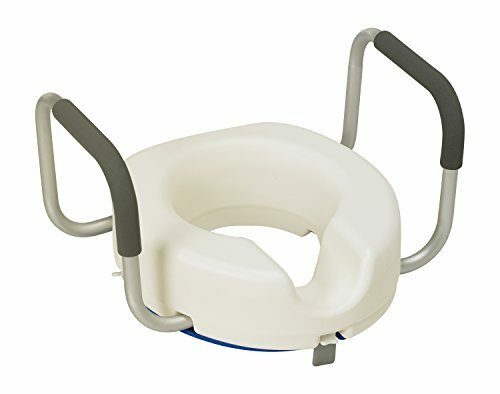 Popular choices in raised toilet seats with arms include the Patterson Raised Toilet Seat With Arms, the Drive Medical 2 in 1 Elevated Toilet Seat, and the Raised Toilet Seat With Arms by Viva Medi. Toilet Surrounds or Frames: Toilet surrounds are the next step up in toilet aids, providing the stability and security of a sturdy frame around the toilet with arms for leverage, skid-resistant legs for security, and cross braces for strength. They’re designed to be placed over the toilet to make it easier for the user to get up and down, and to provide additional support for balance while sitting. Most commonly made of lightweight aluminum, steel, or coated metal, toilet surrounds are designed to remain in place for daily use but are easy to move when necessary. Many toilet surrounds are height and/or width adjustable and come with a detachable toilet seat that can be removed for use with a raised seat affixed to the existing toilet. Most toilet frames are are freestanding but some are designed to be attached to the toilet for additional security. Toilet frames are available for under £30, but most fall into the £50 – £90 range. They make getting up and down easier for the user and offer more stability and security than a simple raised toilet seat, but they take up more space and may be difficult to place in a very cramped bathroom. Be sure to measure the space available for the frame or surround before you start shopping, and take placement into consideration; frames are generally designed to remain in place for daily use, so be sure that the frame won’t restrict access to the door, sink, or shower. 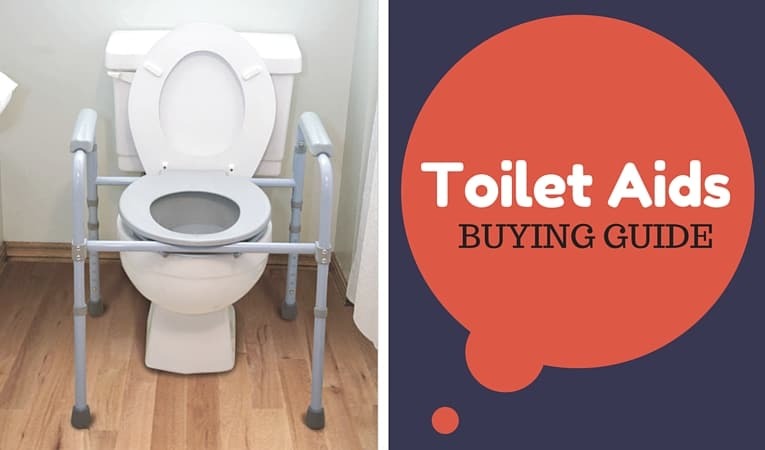 Recommendations: Popular and very affordable choices in basic, no-seat toilet frames include the Sigmobility Free Standing Toilet Frame and the Aidapt Broad Stairs Toilet Frame With Adjustable Height and Width, both of which are available at under £20. The Buckingham Foldeasy Toilet Surround and the Ability Superstore Fold Easy Toilet Surround both fold for easy transport or storage and both fall into the £40 to £60 price range. Well-reviewed toilet surrounds that have seats include the Merlin Raised Toilet Seat Frame, the NRS Healthcare Mowbray Freestanding and Adjustable Toilet Seat and Frame, and the Aidapt President Raised Toilet Seat and Frame, all in the £30 to £70 range. 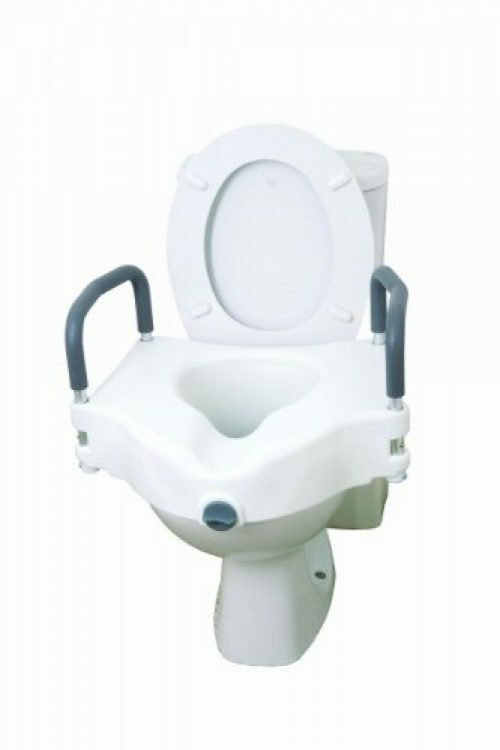 Free standing toilet frame with toilet seat for use over standard toilet. 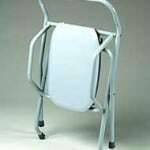 Commodes and Toilet Chairs: These are the toilet aids that come in the greatest variety and the largest price range. A commode is a portable toilet that can be used in any room because it has a detachable waste receptacle that can be removed, emptied, cleaned and replaced. Though commodes are typically used in bedrooms for overnight convenience, they’re also an excellent daytime solution for users who have very limited mobility or who would otherwise have to travel up or down stairs to use the toilet. 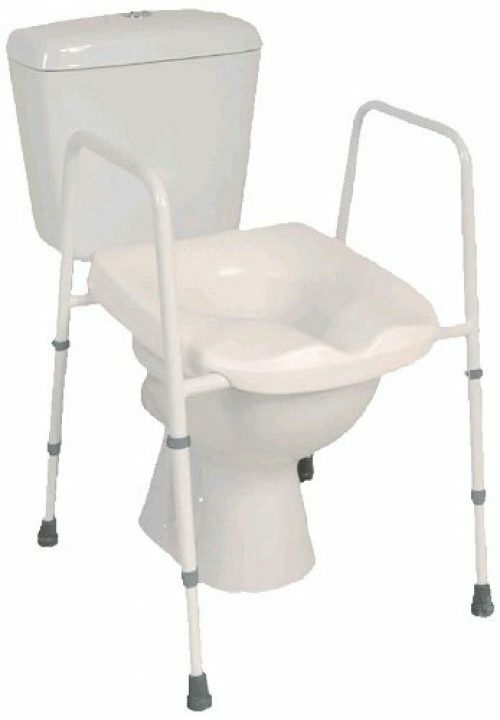 Commodes are available in every format from basic utilitarian frames and fold-ups to full sized furniture. 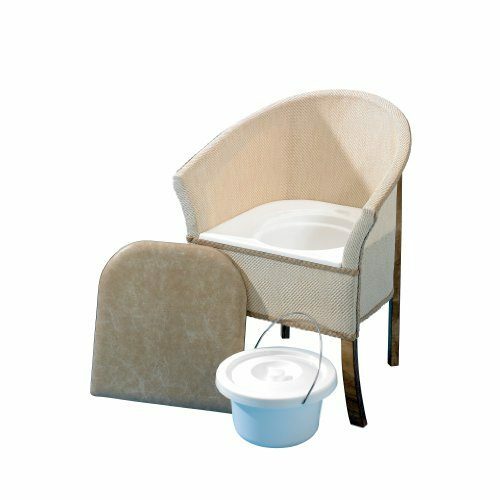 Some commodes even look like an ordinary chairs, cleverly disguising the toilet function with padding or well-placed padding or panels. 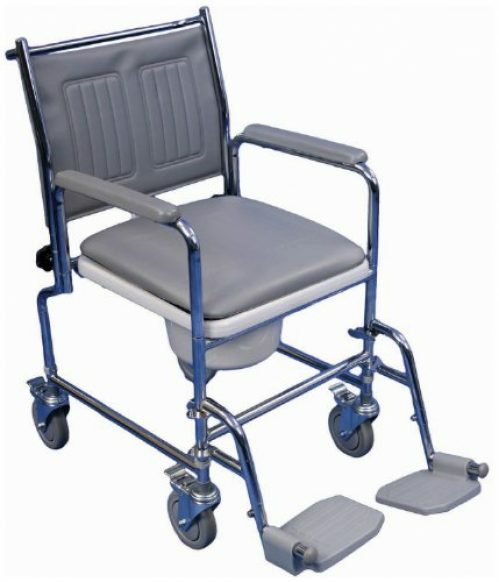 Commodes with wheels can be easily moved from room to room as needed. Commodes and toilet chairs range in price from under £30 to well over £300 or even more, depending on their size, materials, and features. They’re generally meant to be left in place for daily use, which is very convenient for users with severely limited mobility, but the waste receptacle must be removed, emptied, cleaned, and replaced regularly; depending on the user’s capability, this could be a task that requires assistance. 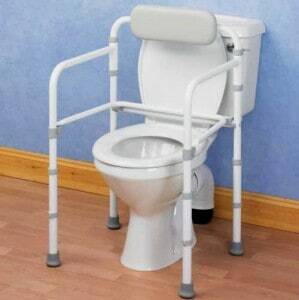 Commodes take up a certain amount of space and must be carefully placed in order to be usable without blocking access to the door or other furniture in the room. 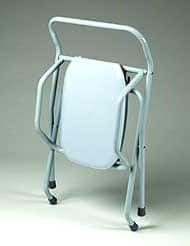 Commodes that have removable arms or other accommodations for side transfer may be a good choice for users who are in wheelchairs. Always measure the available space before starting to shop and keep the logistics of the room in mind; it’s crucial to find a commode that can be placed where it’s usable without blocking access to the door or other furniture in the room. Look for models with waste receptacles that are easy to remove for cleaning, particularly if the user will be expected to take care of it without assistance. If the receptacle is difficult to remove or the commode has to be moved in order to detach the receptacle, it may not be a practical choice. 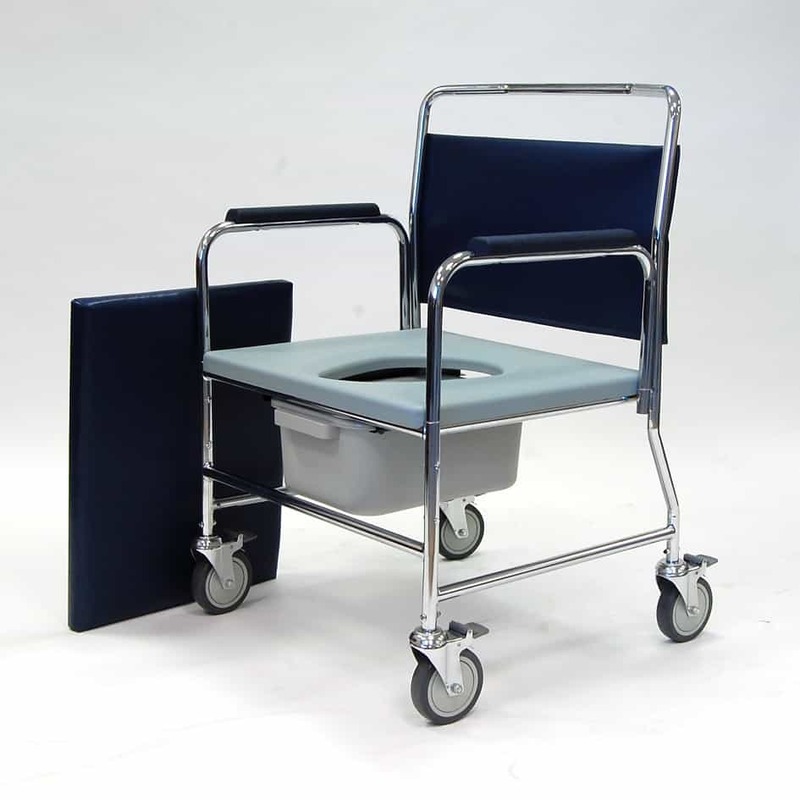 Popular budget commodes that cost under £50 include the Drive Medical Folding Commode, the Days Adjustable Height Commode, and the Easy Clean Economy Commode with Detachable Over Seat. 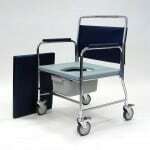 For users who need a a wheeled commode, the Aidept Height Adjustable Commode and the Days Chrome Plated Steel Mobile Commode both feature easy mobility at a price well under £50. If you’re looking for a commode that looks like an ordinary chair, consider the Homecraft Bedroom Commode Chair, the Aidept Dark Wood Commode, or the Basketweave Commode Chair, all of which are available in the £150 price range.